February 07, 2017, LONDON, UK. Press Dispensary. 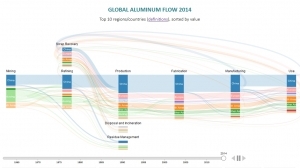 The International Aluminium Institute (IAI), the global association of aluminium producers, today launched a new web-based tool to visualise the aluminium value chain, from bauxite to scrap, including inter-regional trade flows. In a fast changing sector, which has seen new regions of production and consumption - led by China - grow at unprecedented rates in recent years, understanding inter-regional flows of raw materials and final products has never been more important. The IAI's mass flow visualisation, available at www.world-aluminium.org/statistics/massflow, allows users to manipulate an animated Sankey diagram, showing the production, consumption and trade of bauxite, alumina, ingots (primary and recycled), semis, final products and scrap across nine regions over the period 1962 to 2014. • In 2004, 15 million tonnes of scrap were available worldwide. In 2014 this scrap availability had increased to 26 million tonnes. • North America, historically the largest generator of scrap globally, has been overtaken by China, which generated 6.5 million tonnes of scrap in 2014. • In 2014, 17 million tonnes of aluminium contained in final products was traded between the nine regions, followed by aluminium contained in bauxite (15 million tonnes), aluminium contained in alumina (14 million tonnes), ingots (12 million tonnes), semis (5 million tonnes) and scrap (4 million tonnes). Launching the web-based tool at the 14th International Aluminium Recycling Congress in Manchester, UK, the Institute's Director of Product Stewardship, Marlen Bertram said "the visualisation is a powerful way to express the results of the aluminium mass flow model, which has been developed over the past fifteen years by the IAI and its members, industry partners and regional and national aluminium associations, in conjunction with Professor Daniel Müller and his team from the Norwegian University of Science and Technology. The Institute will update its mass flow model and the animation annually, with 2015 data being added in the next few months and 2016 data by the end of 2017." Roland Scharf-Bergmann, Senior VP & Head of Recycling at the aluminium company Hydro and Chair of the European Aluminium Recycling Division welcomed the development: "The mass-flow visualisation, built on data shared with IAI from industrial partners along the aluminium value chain and across the world, underlines the excellent cooperation within the aluminium industry and its openness to sharing knowledge and data with stakeholders globally". The IAI is the global forum of aluminium producers, with 27 member companies, dedicated to the development and wider use of aluminium as a competitive and uniquely valuable material. The IAI in all its activities supports the concept that aluminium is a material that lends itself to improving people's living standards in a sustainable fashion. The IAI continues to promote the sustainability benefits of aluminium applications and a strong aluminium industry through a whole lifecycle approach. • To support the industry in meeting challenges from competing materials, customers and other stakeholders based on production impacts in isolation from the benefits of aluminium use and at end of life.